I actually got this CD for Christmas last year from a dear friend who had listened to me raving about Love Story the musical and put together a little Love Story/Howard Goodall package which included this collection of Christmas carols. Being the ungrateful sod that I am, I didn’t really listen to it (no-one really listens to carols after Christmas Day do they…) but when I finally got round to giving it a spin, I was blown away by the most beautiful set of arrangements and utterly gorgeous singing that makes this the best Christmas CD I could ever imagine, traditional or otherwise. 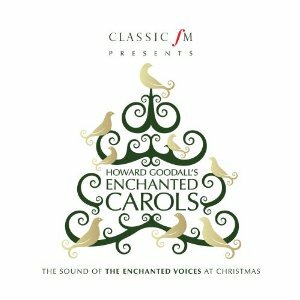 Howard Goodall’s Enchanted Carols is a mixture of familiar Christmas carols and six new pieces by Goodall, sung by an ensemble of female soprano choristers with the barest of accompaniment: solo cello, handbells and chamber organ. The arrangements frequently take inspiration from medieval plainsong and chants and so occupy a space of haunting beauty, long phrases of high soprano lines intertwining and harmonising and generally sounding absolutely glorious. My favourite track is one of the new ones: ‘Angelus ad Virginem (The Angel and the Virgin)’ which is pretty much what I imagine the journey to Heaven might sound like. The ascending and cascading complementary vocal lines that recur throughout this song are so beautiful I could listen to them over and over and inspire a strange kind of calm, of peace, even of spirituality which for this heathen soul is no mean feat. Elsewhere, the arrangements of ‘The Angel Gabriel’ and ‘The First Nowell’ transform these well-known songs into fragments of crystalline beauty, as delicate and captivating as falling snowflakes. I am often accused of hyperbole, but I would rather be passionate about the things I love than hide behind the overused 4 star rating that many fall back on to denote things of great quality. And believe me when I say that this is one of the most gorgeous set of Christmas carols you could hope to hear. Goodall really does bring something fresh and new to these (mostly) intimately familiar tunes but something that feels like it has always existed at the same time. Pure angelic magic.